I mentioned the Quinte Exhibition yesterday. The word 'Quinte' is an interesting one; it seems to me to be a perfect microcosm of the recent human history of this part of the world. It's pronounced Kwintee and is an anglicisation of the French word Quinté, which itself is a frenchification of a Cayugan word which is usually written as Kente. 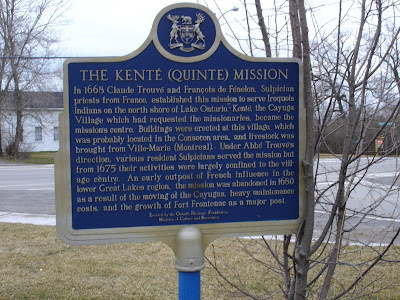 French missionaries from Québec were invited to this area in 1668 by the Cayuga people who had some settlements here (though the main Cayuga territory was on the southern side of Lake Ontario), including the village of Kente. The blue plaque in Consecon tells part of the story. Having arrived at Kenté we were regaled there as well as it was possible by the Indians of the place. It is true that the feast consisted only of some citrouilles (squashes) fricasseed with grease, which we found good; they are indeed excellent in this country and cannot enter into comparison with those of Europe. It may even be said that it is wronging them to give them the name of citrouilles. They are of a very great variety of shapes and scarcely one has any resemblance to those in France. There are some so hard as to require a hatchet if you wish to split them open before cooking. All have different names. A brutal fate awaited the natives that were left behind. In 1687, from his base at Fort Frontenac, a new French Governor, the Marquis de Denonville and his Iroquois allies attacked and tortured the remaining Kente natives, taking those who survived back to France to work as galley slaves. The mission and the village were short-lived, but the area now called Prince Edward County became known as the Isle of Quinte (or Quinte's Isle) and the stretch of water between it and the mainland to the north is still called the Bay of Quinte. Not much comfort to those poor Cayugas, I'm sure.